St. Martin's Press, 9780312000486, 240pp. A chance meeting around a safari campfire on the banks of the Mupamadazi River leads to The Last Ivory Hunter: The Saga of Wally Johnson, a grand tale of African adventure by renowned hunting author Peter Hathaway Capstick. Wally Johnson spent half a century in Mozambique hunting white gold—ivory. Most men died at this hazardous trade. He’s the last one able to tell his story. In hours of conversations by mopane fired in the African bush, Wally described his career—how he survived the massive bite of a Gaboon viper, buffalo gorings, floods, disease, and most dangerous of all, gold fever. He bluffed down 200 armed poachers almost single-handedly, and survived rocket attacks from communist revolutionaries during Mozambique’s plunge into chaos in 1975. In Botswana, at age 63, Wally continued his career. Though the great tuskers have largely gone and most of Wally’s colleagues are dead, Wally has survived. His words are rugged testimony to an Africa that is now a distant dream. 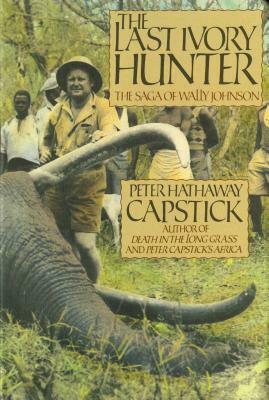 Peter Hathaway Capstick (1940-1996), a former Wall Street stockbroker turned professional adventurer, was critically acclaimed as the successor to Hemingway and Ruark in African hunting literature. After giving up his career, the New Jersey native hunted in Central and South America before going to Africa in 1968, where he held professional hunting licenses in Ethiopia, Zambia, Botswana, and Rhodesia (now Zimbabwe). Capstick also served in that most perilous of trades—Elephant and Buffalo Cropping Officer. In addition to writing about hunting, he was also featured in an award-winning safari video and audio tapes. Captstick settled in Pretoria, South Africa with his wife Fiona until his death at age 56.